Abelow PR is top Boutique Luxury & Travel Public Relations Agency for Hotels, Travel, Luxury Lifestyle, Tourism, Culinary & Liquor, Spa, Fashion and more. We advertise affordably through media relations, influencers, branding, and social media... marketing in NYC. Abelow PR has the influence, where it matters. Our firm is known for creating big impact - bringing together our diverse experience and public relations expertise to elevate brands to the next level. 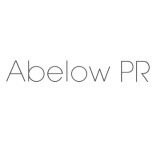 Abelow PR is eager to hear from you. Connect directly with our New York office and let us know how we can best assist you or call 212-941-9247.